Top 1 between Top 10 best hotel breakfast, El Viajero de El País . Because start good in the morning is fundamental, we work hard to have a great breakfast that you will not forget. Homemade bread, and sweets, served in one of the best places of the house is our secert. Let´s enjoy! Bikefriendly is a quality certification that means that La Casona de Los Güelitos is well equipped to recived guests that travel with their bikes. 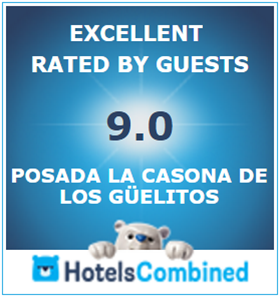 La Casona de los Güelitos is certified by the Cantabria Infinita Quality Club which is an award for our well done job that we have carried out for several years. A step away from the mansion, near the center of Santillana del Mar near the original cave, you'll find the Museum of Altamira. If you like experiencing strong emotions like rafting, caving, canoeing or playing Paintball, we will make your experience a great adventure. Cookies are small text files that are stored on the device of the Internet user to visit a web page. Is the website operator that determines what information the cookie contains and what its purpose is , and they can also be used by the web server every time you visit that site . Cookies to save time and make the experience much more efficient web browsing are used. However, they can be used with several different purposes ranging from recall information logon or what's in your purchase order. Cookies are only associated with an anonymous user and your computer / device and not provide references that reveal personal data. At all times you can access the settings of your browser to modify and / or block the installation of the Cookies. In the case of being blooquedas Cookies , how some sections of the website may be impaired. These cookies collect information about how you use the website (eg , the pages you visit or if an error occurs ) and also help webexpertia localization and troubleshooting website. All information collected therein is completely anonymous and helps us understand how our site works , making the appropriate improvements to facilitate navigation. These cookies are managed by third parties, so you can use these tools to restrict the use of these cookies. Some cookies are used to link to other websites that provide certain services to www.lacasonadelosguelitos.com , such as the case of Facebook , Twitter, Google or TipAdvisor . Some of these ads Cookies amend other websites to suit your preferences . In addition to accepting or rejecting the use of certain cookies through www.lacasonadelosguelitos.com website , you can also manage them using your browser settings . Just will read or write cookies about your preferences . Those that have been installed before modifying the configuration will remain in your computer and you can delete them using the settings of your browser. If you need additional information about how to configure detailed Cookies by supplier or manage your preferences , visit the website Your Online Choices . We update our Policy ? Cookies?